I like going to the X the day tickets go on sale. I'm not a season ticket holder, but I don't mind getting in line and getting first dibs on the games I want. I have made every home opener since 2006. And the folks at the X are always nice to people waiting in line. There are always free cookies, muffins, donuts, juice, milk and soda from the good people at Kwik Trip. My mom and I arrived about 7:45am (for 9am onsale) and we were about 60th in line. We got to the windows about 9:30 and it we had our tickets. Oh and some guy from "Becoming Wild" asked us some questions. And used one of my mom's answers. (Mom is answering a question at :27, that's me giggling in the background). The first chance to see all the players likely to make this year's team. It's fun and it's free. I went to both days. Yes, there was only one goal scored in the two days, but that could be a good thing right? After all, all the critics are questioning the team's ability to defend this year. Yes it lacks the intensity of an actual game, but this is a welcome respite of surviving a whole summer of not watching hockey. And imagine how wound up I'd be if I actually were a baseball fan. My lovely wife Heather took these pictures :). I don't know if the team does this every year. It seems to me I remember this a few years back and I couldn't attend. But again, it's a chance to get a close look at the X and skate on the ice :)! There was a scavenger hunt (which we didn't win :( ) for a chance to win a 10 pack of tickets. A very informative Q & A with GM Chuck Fletcher and Head Coach Mike Yeo. My wife and I were also able to tour the press box, the video room, and the fishing lodge club under the lower bowl. It was a fun day, and they let us do it all for free! 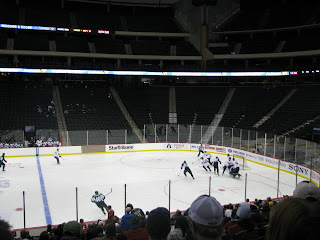 Well seeing as how season ticket holders are just trying to give their preseason tickets away, my brother and I took my wife and our mother to the Wild's preseason game against St. Louis. By the way, I recommend using Ticket King to buy tickets on the aftermarket. They had prices as low as craigslist for this game, the pickup is convenient, and they didn't charge any hidden fees. So much video this summer of me looking ridiculous. Obviously, all of these things don't compare to when regular season hockey starts, and hopefully there will be playoffs in the Wild's future (Wild preview on Friday). But before October comes around, I enjoy taking advantage of the things like the open house, or open scrimmage. And I enjoy taking advantage of cheap tickets, even if its for exhibition hockey. I don't recall making all of these things in one season before, but now that I have, I hope to do most of these things every year :). It's back to the 200 level with me on Saturday, but I can't wait to be there!